Washington Rep. Pramila Jayapal (D) speaks at a Handsoff rally. Image via Wikimedia Commons/user/organization:AFGE. (CCA-BY-2.0). Washington Rep. Pramila Jayapal (D) headed across the U.S. border on Saturday, offering assistance and support for thousands of migrants gathered in Tijuana. Before setting off for the U.S.-Mexico border, Jayapal paused to offer her perspective on the migrant caravan that’s been prodding political tensions for weeks. Taking on President Donald Trump—who’s frequently referred to the group as an invading force, full of criminals and “bad people”—Jayapal implied the commander-in-chief is manipulating the movement for political purposes. “He’s created a crisis at the border,” Jayapal, who heads the House Progressive Caucus, said. POLITICO notes that Jayapal’s visit follows a tense few days along the border. Tear gas was deployed last week to keep migrants at bay as some tried to rush across the San Ysidro port of entry. The use of tear gas has drawn criticism from some Democratic leaders. Jayapal cited the incident—which led to the San Ysidro crossing being temporarily closed down—as motivation for visiting the border. 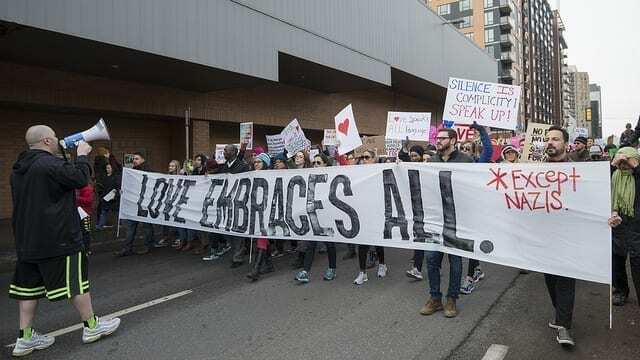 Minneapolis protesters march in support of immigrants and refugees in 2017. Image via Flickr/user: Fibonacci Blue. (CCA-BY-2.0). President Trump defended the use of force last week, claiming that some members of the caravan had thrown rocks at American agents. The migrants, for their part, say they were just trying to draw attention to their cause. Submitting asylum applications has become decidedly more difficult in recent months. Last summer, former U.S. Attorney General Jeff Sessions tightened the criteria under which prospective migrants can apply for asylum within the United States. Under Sessions’ guidance, persons fleeing gang violence and domestic abuse were precluded from applying for asylum. And, as news of the migrant caravan shook up the White House, Trump officials took steps to block asylum-seekers from requesting protected status if they were detained at unauthorized entry points. Progressives like Jayapal claim that the administration’s efforts to curtail asylum applications illegal under international and domestic law. Jayapal says part of the reason she went to the border was to ensure that asylum-seekers are given a fair chance to have their voices heard. “I was able to successfully assist 5 asylum seekers – 2 unaccompanied minors, a mother and her 9 year old child, and a young man with a serious medical condition – into the United States,” Jayapal wrote Saturday evening. The Indian-born politician lashed out at Trump over the weekend, blaming him for “creating the crisis” just south of the California border. Jayapal claims that all five the migrants she helped filed asylum petitions were turned away until she intervened. “Initially they were denied, in violation of U.S. and international law, but I was able to intervene and ensure that they could simply present themselves for asylum in the United States,” Jayapal tweeted. POLITICO says that Jayapal is expected to meet with advocates and international law experts after the weekend’s over.